What is better way to see such a beautiful country than by the bicycle? 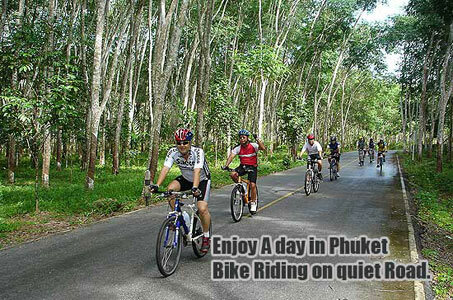 The natural scenery around Phuket is some of the best in Southern Thailand. 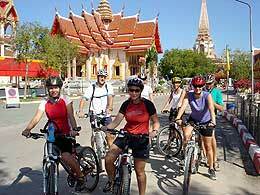 Cycle by the sea, through some beautiful valleys, and through coconut groves. pick up from your hotel and head for the north end of the island to start your bike adventure. After the biking brief of routes, pedal and safety instructions, we will bike along the north eastern part of Phuket by schools, farmer villages, idyllic rubber plantations, and stunning valleys on roads and trails. Picturesque coconut groves and friendly locals will become familiar sights along the way. On route your guide will point out local plants and places of interest. We will lead you through small villages along the quiet back roads where you can enjoy the gorgeous scenery and local culture up close where the traditional way of life has remained unchanged. Have coffee at a local coffee shop try the traditional Thai coffee and a snack. Visit a local house and see how the people live. * swim before heading back home. 1. Times may vary according to the ability of the riders.